Herbs are perfect for balancing dessert ingredients in any dish. With an endless variety of flowery to spicy notes, they add brightness and earthy flavors to any season and elevate all desserts to a more sophisticated level. Here’s a list of favorite herbs that are commonly used to enhance sweet dishes. Use the information to explore and discover new ideas for yourself. Mint: Nothing is more refreshing than mint, a worldwide culinary favorite there are a quite a few good ones to choose from. Some of the more widely used and favorites are peppermint and spearmint, but orange, pineapple and apple are other good choices. Good with nearly any fruit (raspberries marry perfectly with this herb). Mint adds refreshing taste, aroma and color to sorbets, pies, jellies, and is delicious in fruit salads. It also does well when baked with fruits such as pears or apples and the perfect choice to pair with chocolate. Lemon balm, lemon verbena: Lemon flavored, highly aromatic herbs add both sweet and citrus flavors to desserts. Successfully used in pies, cakes, custards, jams, and jellies, you can also simply sprinkle freshly chopped in fruit salads and sorbets and other berry dishes. Verbena is denser with citrus oil than balm, so be sure to adjust your recipe accordingly. Rose: Who doesn’t love the intoxicating aroma of roses? These scents also lend an endless variety of exotic touches to desserts. Rose petals, rosewater, and rosehips are all successfully used to create a variety of syrups, jellies, candies, and frostings. Treat them like you would any new flavor, taste-test first to see if it leans to the sour or bitter side since no two roses are alike. Citrus fruits or other mild flavored fruits when used in tandem, accentuate the delicate scent of rose. Lavender: Lavender pairs beautifully with the slightly nutty, sweet flavor of peaches. Rosemary: Often used in pastries and breads, this aromatic herb is perfect for desserts too. Angelica: Offering a woody and slightly bitter flavor, it is both a medicinal and culinary herb. Fun and easy to use, these edible, aromatic plants add flavor and nutrients to whatever dish they are included in, including sweet desserts. They are calorie free, adding extra flavor without adding extra pounds. You can purchase dried or fresh herbs locally but its best to go organic to be sure they have not been sprayed or irradiated with chemicals. 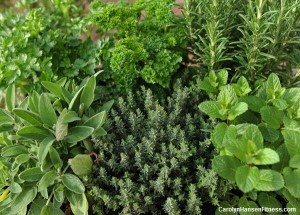 For the most part, fresh herbs are more subtle, but fresher in flavor and require more than dried herbs which generally offer more concentrated flavor and can sometimes be a bit more bitter than the fresh variety. 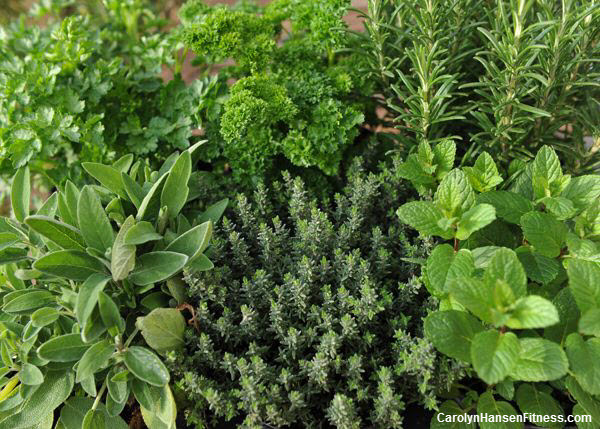 Don’t be afraid to experiment growing your own herbs inside or outdoors. It can be quite rewarding to flavor and enhance your desserts with herbs from your own garden, knowing you are giving your immune system a boost at the same time. Be adventurous and begin playing and experimenting with different herb variations in your favorite recipes and explore the possibilities and taste differences they produce. You’ll soon become a master of “herb flavors,” enhancing all your dessert and sweet treat recipes with exotic flavors and scents while empowering them with antiviral, antibacterial and antioxidant properties of different herbs. Remember, its never been about the amount of calories going in but about the amount of nutrients consumed. Make every bite count. If you are ready to expand beyond your traditional recipes and upgrade them to a more nutritional level you will love my newest creation…“Blended Bites.